At Pink Weddings, we have created a number of fantastic "Special Moment" packages for you to add to your enjoyment, Civil Partnership or wedding day. These packages are only a sample of what we can create for you, whether your looking for a "special Moment" just for the two of you or a group, we are confident we can add that extra sparkle in your evening. Our London Packages are "all in", hotel, show, dinner and after celebration, take your pick from any top West End show, stylish restaurants and CHIC to GAY clubs and casinos. Why not try our English Evening? The evening begins with a traditional dinner at the decadent �Simpson's on the Strand ' restaurant, where the sumptuously cooked menu awaits. Then take your seats at one or other of London's most popular shows; Willy Russell's devastating musical, �Blood Brothers', or the new smash hit, with music by Elton John, �Billy Elliot'. Both tell tales of intensity, cloaked with fantastic scores, certain to be moving you to tears! Take a short ride to Covent Garden , and find your name guest-listed at the fabulous night spot, Browns to finish off your evening. This is a package for the more adventurous of you! Try something new at the fantastic Mongolian Barbeque on Maiden Lane in Covent Garden. The menu is guaranteed to hold a few surprises for everybody! Less than two minutes walk round the corner is the dazzling show, Stomp! Anything goes here, as the most unusual of object s are turned into a display of rhythmic dexterity, certain to blow you away with their dynamic and explosive energy! To finish off your night, one of Café de Paris' decadent promotion nights will guarantee to keep you enthralled for the remainder of the evening! This decadent package is one of the most popular! Start your evening at one of our great French restaurants, perhaps �La Palace du Jardin', or �Chez Gerard Opera Terrace'. Following your meal, be transported into the Parisian dungeons below the Opera House to experience the music of the night, in the fabulous � Phantom of the Opera '. Alternatively take your seats for a tale of pre-revolution poverty and misfortune as they spin a web of intrigue and mortality in the most successful musical of all time, �Les Misérables '. After the show, finish off your night of Parisian fun on the V.I.P. guest list going to the world famous Café de Paris super chic nightspot! This is one of our most successful packages of all time! The unique Rainforest Café plays host to you, for your pre-theatre meal. Be watched over by all manner of wildlife as you enjoy your meal, only to be interrupted every now and then by a tropical thunderstorm! 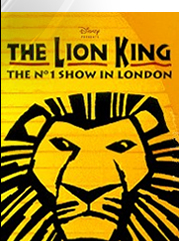 The sounds of the Jungle won't be that far away as you take your seats for the smash hit, number one show, �The Lion King.' One of Disney's real masterpieces, wrapped in a fabulous score by Elton John, the visual effect of this show is simply stunning. Finish of your night with some moves at the excellent Zoo Bar in Leicester square, or try a few late drinks in the decadent Tiger-Tiger bar in the Haymarket. Summers here and so is the fun! This wonderful package combines two best seats for the BBC Proms at the Royal Albert Hall; the world's longest running music festival and a late fabulous meal at the Babylon Roof Garden restaurant, just around the corner! Enjoy a drink on us with some hospitality at the Royal Albert Hall before the concert. See one of this years great Proms before making your way down Kensington High Street to the Babylon to sample one of the more audacious menus on the London restaurant scene. Your chance to hang out with the hip and trendy at one of London 's premier nightspots, The Wellington Club is also available, to complete your night. Its Rock and Roll time! Take your pre-theatre table at London 's best barbeque, Bodean's. Embrace the Biker inside and stock up, as the portions are of gigantic size! A short trip away is the hugely successful Ben Elton and Queen musical, �We Will Rock You!' Let Mercury, May and co. replay those timeless classics from years gone by as the Bohemians try and save the world! It's another short ride to the fabulous cocktail haven that is the American Bar in the Savoy Hotel for a couple of Vodka Martinis to finish of your Rock and Roll evening of excess in style! This is the real Party Piece. For anyone wanting to host a weekend of fun, an anniversary, wedding, birthday or event, this is the one for you. We will put all your guests up in a top hotel, combine best seats for Mamma Mia with a sit down 3 course meal at Café de Paris, where the club is yours for the day. Themed however you would like, it's a free reign for us to really give you the Royalty treatment! Choose from a variety of other fun packed excursions to fill you weekend to the brim! Class E Mercedes to transport you from stop to stop. Extensive list of other night clubs. Why not �Build your Own' package. We can offer a wide range of other services. If there is some thing you would like you cant see, we'll get it for you! We reserve the right to change any element of the package due to unforeseen circumstances. All packages are subject to availability. Once confirmation is made, refunds or exchanges are only applicable with the concessions of our package broker. Set menus and regulated levels of alcoholic beverages may apply in each package booked. Prices may vary between the same packages due to fluctuations in availability. Once confirmed, clients are required to adhere within the discretion of any venue.